Preheat frying oil in a medium pot over medium-high heat. Gather the rest of your ingredients. Spoon 2 tablespoons of frosting into the center of each egg roll wrapper. 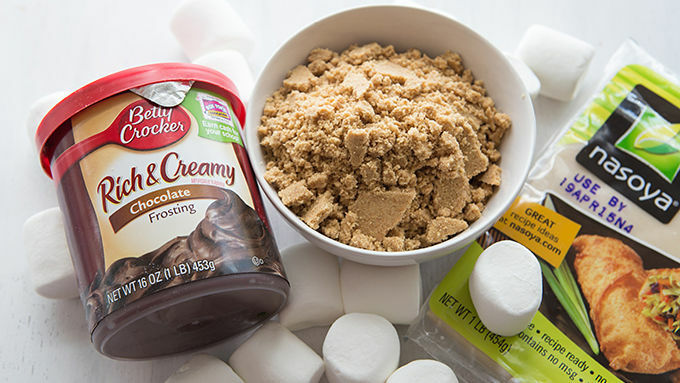 Sprinkle 1 tablespoon of crushed graham crackers on the frosting, and top with two marshmallows. 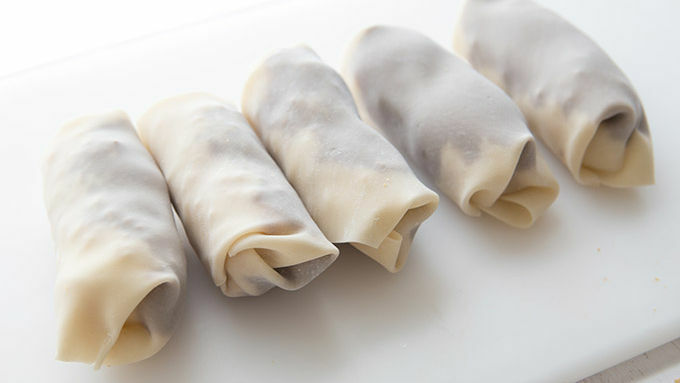 Moisten the edges of the egg roll wrappers with a little water, then fold in 2 of the diagonal end corners to the center and roll the wrapper egg-roll style over the marshmallows, tightly securing the ends so the filling doesn't seep out while frying. Place egg rolls seam-side down into the pot of hot oil. Fry just until golden brown. Remove from oil, drain on paper towels, and place on a serving platter. Drizzle with chocolate sauce, or serve with chocolate sauce for dipping. Serve immediately, taking care with potentially hot fillings. S'mores on a whole new level – fried into a crispy crunchy spring roll. This delicious party treat will have them all talking... with their mouths full. Put out the campfire and head inside this spring! No, we’re not advocating more time indoors, but that’s where all the magic happens with this 20-minute dessert recipe. 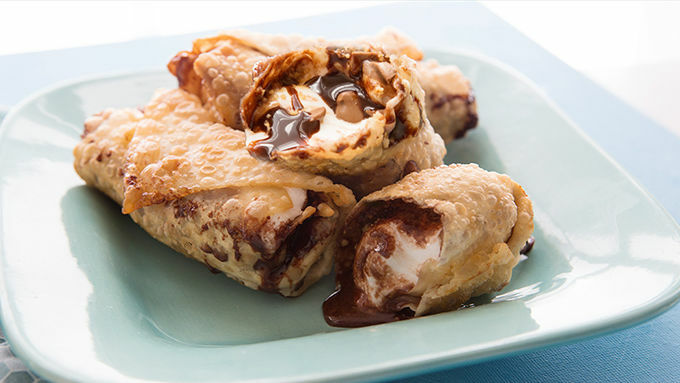 If you love spring as much as we do, then you’ve got to get Crispy S’mores Spring Rolls in your life – NOW. They have all the best parts of a s’more—gooey marshmallow, melted chocolate, and crunchy crackers. Only in this version, the crunchy cracker is actually a quick-fried crispy roll, cooked until golden and filled with gooey chocolate-marshmallowy goodness. 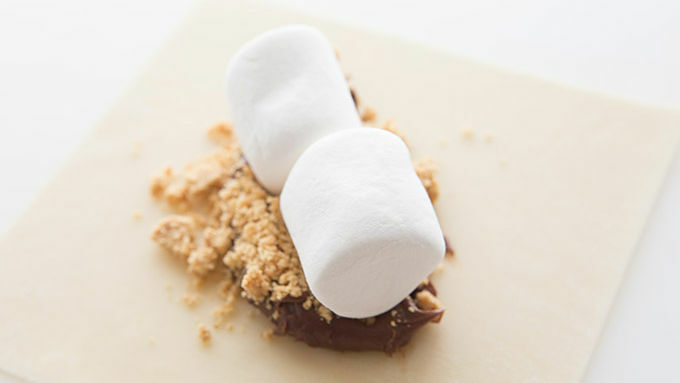 To make this recipe, you’ll need just a few simple ingredients and an insatiable craving for fast s’mores. Because you’re about to have these babies coming hot off the stove and ready to serve! These spring rolls are best right out of the fryer, making them the perfect lazy party treat for when everyone is gathered in the kitchen and ready to eat whatever you make them! Drizzle with chocolate sauce and serve 'em up! Crispy Spring Roll S’mores. They may be the best thing since… well… s’mores.